Celeste Currie might be a lot like many of the information management and technology students at Syracuse University. A junior at the School of Information Studies (iSchool), she’s enrolled in the same range of coursework as other IM&T students. She works on the help desk at the University’s ITS computer center. She applies for summer internships at a variety of tech firms. Then, there’s that other thing. Her company was just chosen by Inc. Magazine as one of its 2013 “Coolest College Startups”—one of 12 ventures to receive the honor, catapulting Currie and her Soulscarf business to national prominence. The company originated just last fall when she needed a business concept for the “What’s the Big Idea” course IDS 401, taught by entrepreneurs and iSchool instructors John Liddy and Michael D’Eredita. Soulscarf currently sells just one product, a knitted wrap-around that is trendy, and whose business model has a unique twist. The company donates 20 percent of proceeds on the sale of each scarf to any one of four charities. 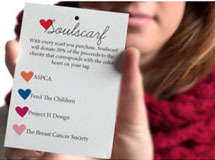 In five months, several hundred of the $44 scarves have sold, and more than $2,000 has been raised for the ASPCA, Feed the Children, Project H Design and the Breast Cancer Society, Inc. A recipient organization is chosen by each buyer, whose scarf is delivered sporting a heart tag symbolizing the donation. If retail is new to Currie, philanthropy comes naturally. Community service and charitable efforts are values she grew up with in Saginaw, Mich., so the idea of a venture that gives back was a given. Other companies may support causes with a portion of profits, but Soulscarf’s share is extremely generous. “I wanted it to be a good amount. I wanted the main aspect of Soulscarf to be that we do give back to other organizations. I felt that 5 percent or 10 percent was not enough; 20 percent was really generous, and it still allows us to be in business and still allows us to make some profits,” Currie details. The young entrepreneur thinks the scarves would sell without the charitable aspect, but believes that Soulscarf’s mission—“to knit the threads of fashion and philanthropy one customer, one charity, one scarf at a time”—is much of the imperative. Being judged as one of Inc. Magazine’s Coolest College Startups was both a shock and exciting to Currie, particularly since she learned of the opportunity just one day before the submission deadline. She scurried to compile and email the digital data to provide a succinct profile. As one of the 12 college companies selected, she won admission to the New York International Gift Fair, where she showcased her goods to extensive markets, and had “a lot of fun, a great experience” meeting with buyers, connecting with other exhibitors and seeing new trends in fashion. This spring, she’s expanding the line to include variations on fabrics, colors and patterns, and adding new retailers and distribution systems. She continues to introduce new technologies, too, incorporating electronic invoicing into a fully functional e-commerce site. Lessons Currie has taken from the fall class and this spring’s IDS 402 (“Idea2Startup”) include being cognizant of all aspects of business. Instructors Liddy and D’Eredita “really taught me how to contextualize the idea, really pushed me and all the students to think of things you wouldn’t normally think of. They are really helpful on the business side, legal side, financial side … the things people don’t really think of as the fun aspects of owning your company. They ask us questions and get us to think. And if we can’t answer those questions, you know when you leave the classroom that you have to look into it and do your research,” she says. For two and a half years now, the junior has greatly appreciated the learning opportunities as well as the community that the iSchool and SU have offered, including a roommate and friends who have helped her create website content, and iSchool professors “who have been extremely helpful and understanding” about schedule conflicts presented by her venture’s success, she says. Though Currie is visionary in her business, she’s practical about her future, building the company while keeping her educational goals on track. That path “is still something I think about all the time. I’m getting a great education, and I have this great startup company, but I still have applied for summer internships,” she says.